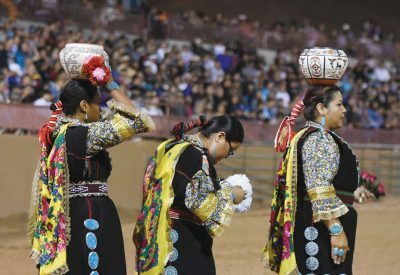 Navajo Times | Rima Krisst Pow-wow dancers make their way into the arena at Red Rock Park. 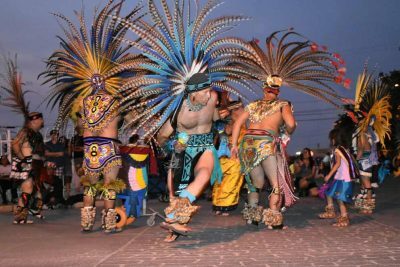 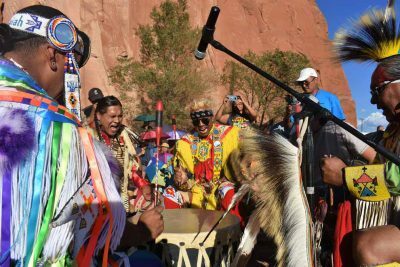 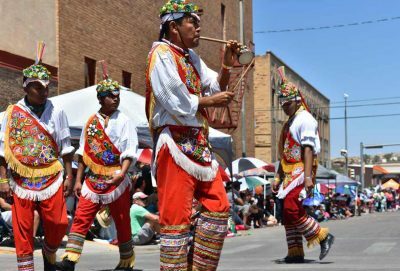 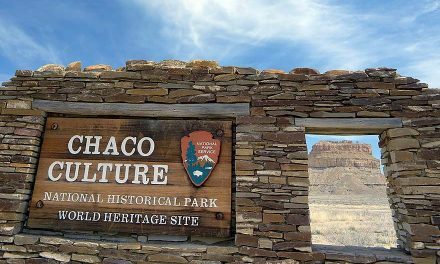 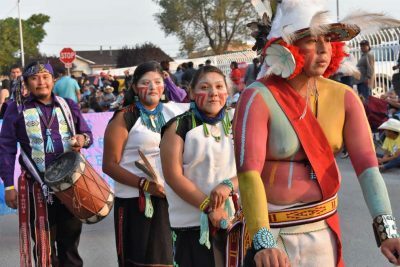 Enjoy a slideshow of photos from the Gallup Inter-Tribal Indian Ceremonial weekend in Gallup and Church Rock, New Mexico. 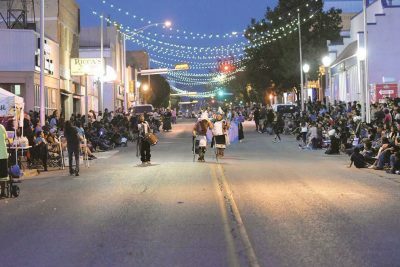 Select any photo to launch a full-screen slideshow. 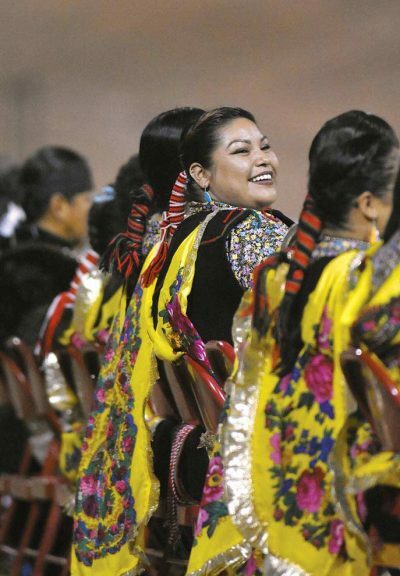 Navajo Times | Rima Krisst Kicking off the powwow with some high vibes. 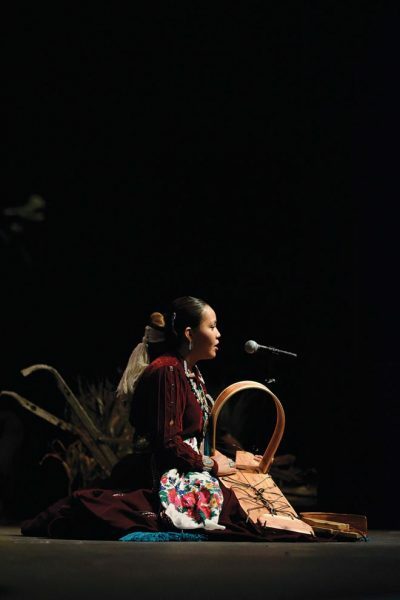 Navajo Times | Ravonelle Yazzie Kiana Boyd, contestant for Miss Gallup Inter-Tribal Indian Ceremonial, talks about the history of the Navajo cradleboard as her traditional talent. 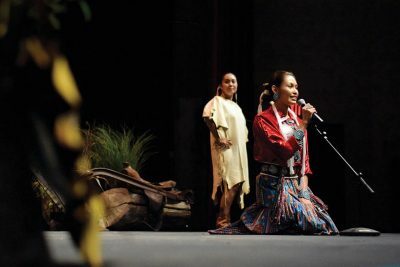 Singing Navajo Times | Ravonelle Yazzie Ashley Claw sings songs in Navajo for her traditional talent at the Miss Gallup Inter-Tribal Indian Ceremonial pageant on Aug. 9. 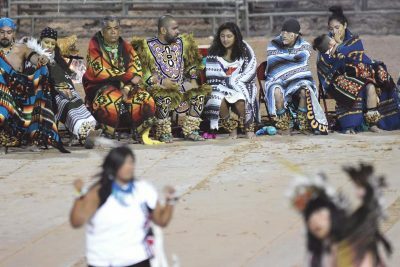 Navajo Times | Donovan Quintero A large crowd is gathered to watch the night parade Aug. 9 during the Gallup Inter-Tribal Indian Ceremonial. 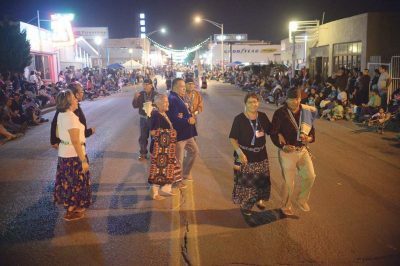 Navajo Times | Rima Krisst Tee Willie (Navajo) represents Northern Traditional style at the Night Parade. 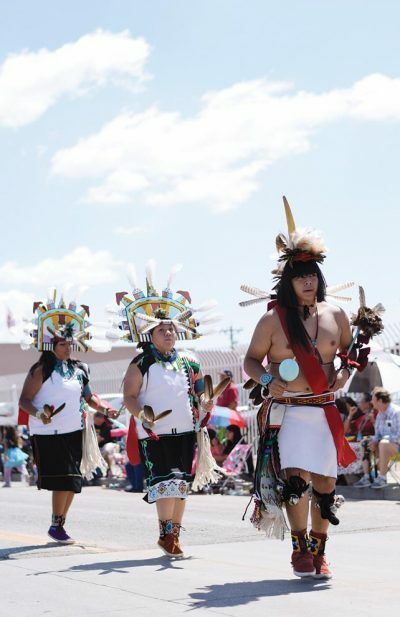 Navajo Times | Rima Krisst Hopi dancers perform at the Gallup Inter-Tribal Indian Ceremonial parade on Saturday in downtown Gallup. 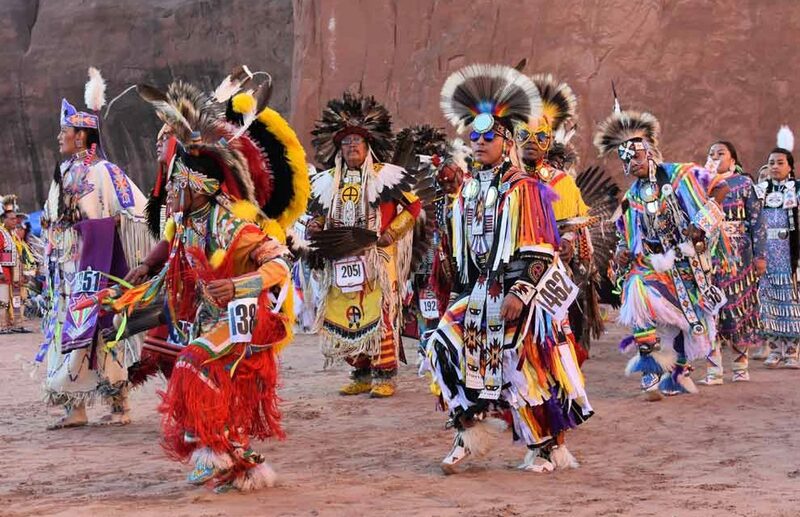 Navajo Times | Donovan Quintero Grass dancer Eldon Owens, center, from Phoenix, dances with the staff in hand during grand entry on Friday evening at the 97th annual Gallup Inter-Tribal Indian Ceremonial powwow in Church Rock, N.M.
Navajo Times | Donovan Quintero Dr. Mario Aguilar leads the Danza Mexicoyti, the Aztec dance group, on Friday night during the 97th annual Gallup Inter-Tribal Indiam Ceremonial night performance at Red Rock Park in Church Rock, N.M.
Navajo Times | Donovan Quintero Dr. Mario Aguilar leads the Danza Mexicoyti, the Aztec dance group, on Friday night during the 97th annual Gallup Inter-Tribal Indian Ceremonial night performance at Red Rock Park in Church Rock, N.M.
Navajo Times | Ravonelle Yazzie Three Zuni Olla Maidens get ready to perform at the Gallup Inter-Tribal Indian Ceremonial night performance on Friday night at Red Rock Park. 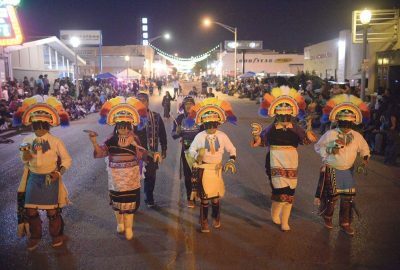 Navajo Times | Donovan Quintero The Kallestewa Dancers, led by Mangaysha Kallestewa, perform on Aug. 9 during the 97th annual Gallup Inter-Tribal Indian Ceremonial night parade in downtown Gallup. 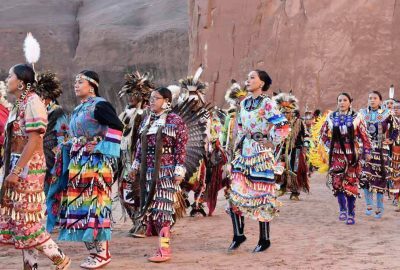 Navajo Times | Donovan Quintero Dance groups wait for their turn to perform at the night performance at the Gallup Inter-Tribal Indian Ceremonial at Red Rock Park. 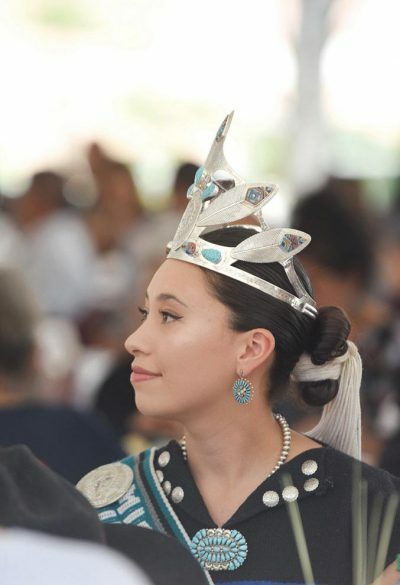 Navajo Times | Ravonelle Yazzie Outgoing Miss Gallup Inter-Tribal Indian Ceremonial Zunneh-bah Martin watches the new queen contestants introduce themselves at the luncheon on Aug. 8. 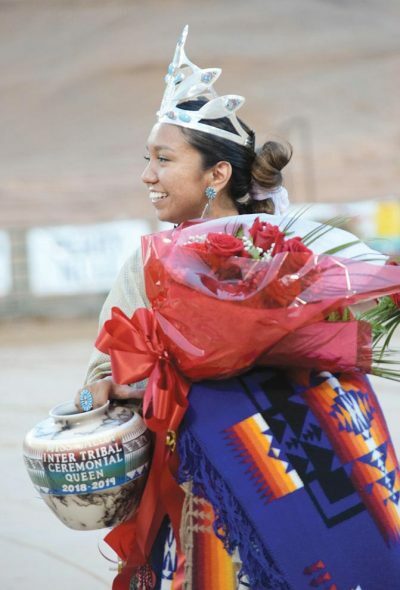 Navajo Times | Ravonelle Yazzie Newly crowned Miss Gallup Inter-Tribal Indian Ceremonial Ashley Claw, of Chinle, carries her gifts after being crowned by outgoing queen Zunneh-bah Martin on Aug. 11. 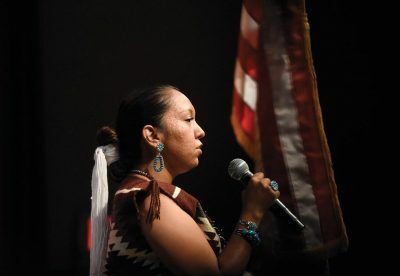 Navajo Times | Ravonelle Yazzie Sierra Vail explains the changes in Navajo women’s fashion with models wearing buckskin cloth to contemporary fashions for her traditional talent on Aug. 9 during the Miss Gallup Inter-Tribal Indian Ceremonial pageant. 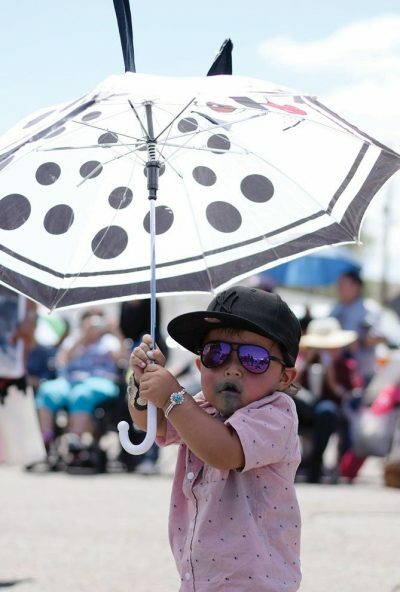 Navajo Times | Ravonelle Yazzie Elliot Frank, 2, keeps himself cool with an umbrella and sunglasses in the Gallup Inter-Tribal Indian Ceremonial parade on Aug. 11. 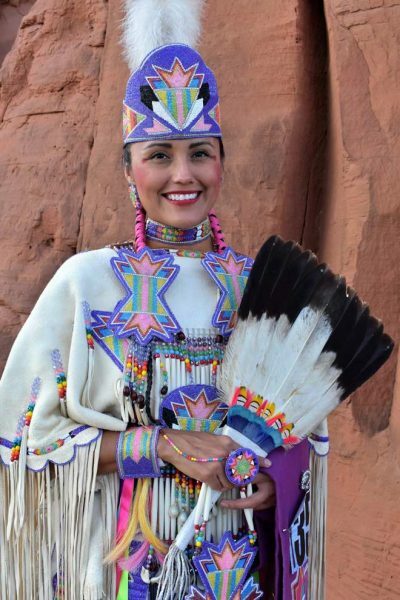 Navajo Times | Rima Krisst Julia “Akeemah” Neel at the pow-wow at Red Rock Park. 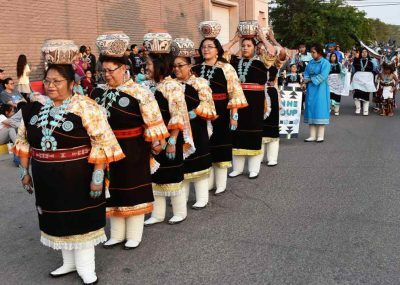 Navajo Times | Donovan Quintero The Zuni Olla Maidens walk down the parade route during the night parade Aug. 9 at the Gallup Inter-Tribal Indian Ceremonial. 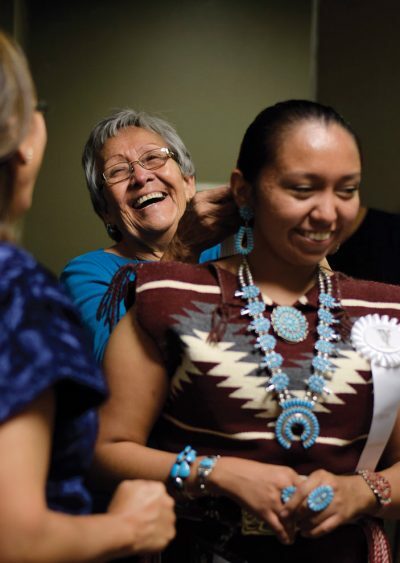 Navajo Times | Ravonelle Yazzie Ashley Claw gets help from her grandmother as she prepares to go onstage for the traditional talent competition of the Miss Gallup Inter-Tribal Indian Ceremonial pageant. 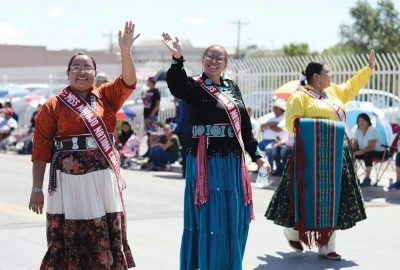 Navajo Times | Ravonelle Yazzie This year’s Miss Navajo Nation contestants are, from left, Kayla Martinez, Summer Jake, and Autumn Montoya walk in the parade on Aug. 11 at the Gallup Inter-Tribal Indian Ceremonial. 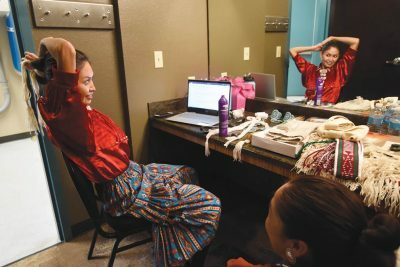 Navajo Times | Ravonelle Yazzie Contestant Sierra Vail fixes her tsiiyéél in the dressing room moments before the traditional talent presentations of the Miss Gallup Inter-Tribal Indian Ceremonial pageant. 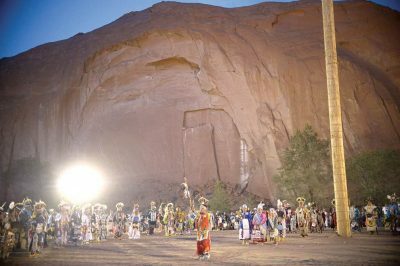 Navajo Times | Donovan Quintero One of the dance groups performs at the night performance of the Gallup Inter-Tribal Indian Ceremonial. 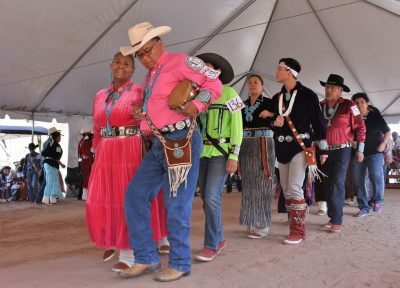 Navajo Times | Rima Krisst The Jones family from Chinle steps into the arena with style and grace. 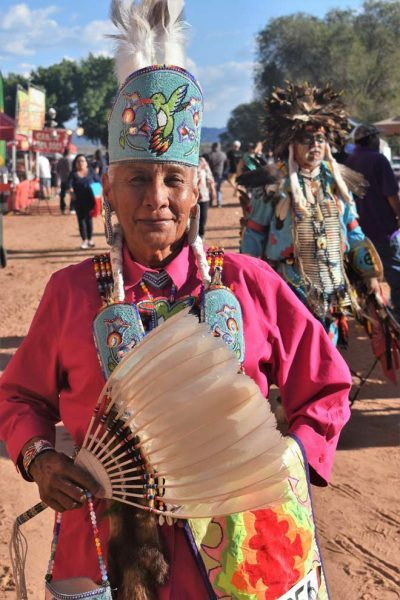 Navajo Times | Rima Krisst Phyllis Manson from Blue Gap, Arizona, prepares for Grand Entry. 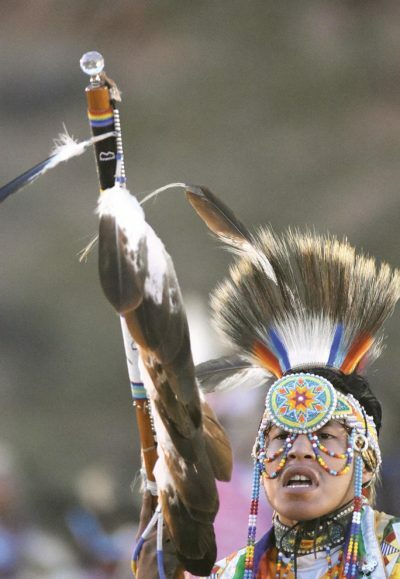 Navajo Times | Donovan Quintero A dancer at the powwow proudly carries an eagle feather staff during the Gallup Inter-Tribal Indian Ceremonial at Red Rock Park. 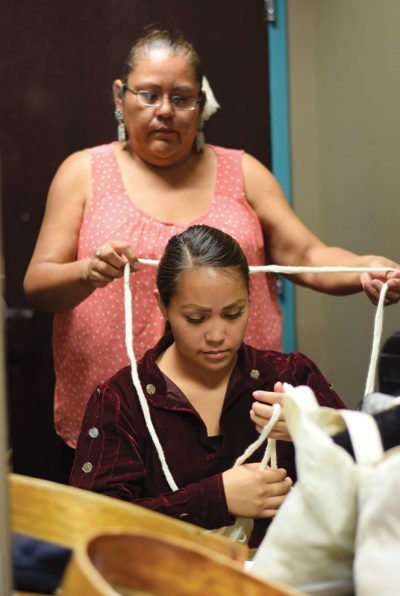 Navajo Times | Ravonelle Yazzie Sheilah Manuelito helps tie her sister Kiana Boyd’s tsiiyéél before the traditional talent presentation at the Miss Gallup Inter-Tribal Indian Ceremonial competition. 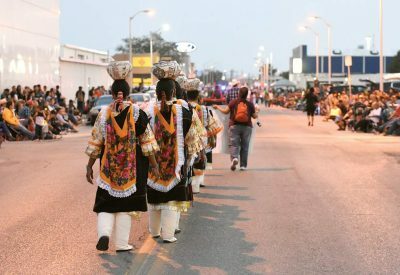 Navajo Times | Donovan Quintero A group of Gallup-McKinley County School District employees perform a two-step on Aug. 9 during the 97th annual Gallup Inter-Tribal Indian Ceremonial night parade in downtown Gallup. 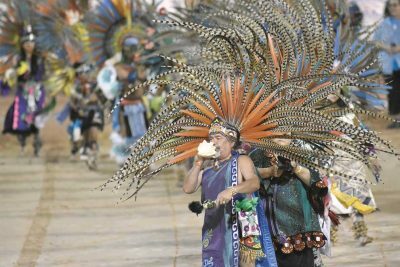 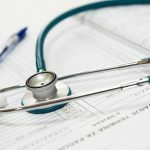 The group had no official group name. 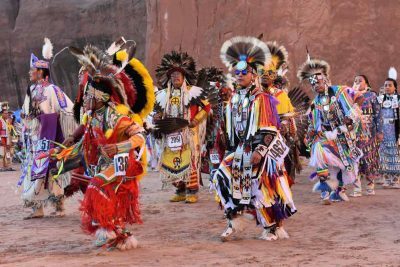 Navajo Times | Ravonelle Yazzie Hopi dancers perform at the Gallup Inter-Tribal Indian Ceremonial parade on Saturday in downtown Gallup. 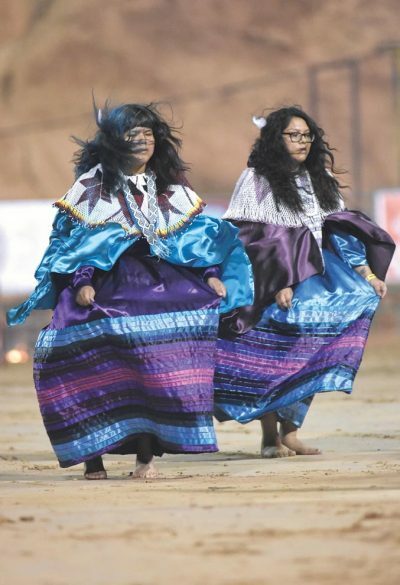 Navajo Times | Rima Krisst Ceremonial Grand Entry at the pow-wow. 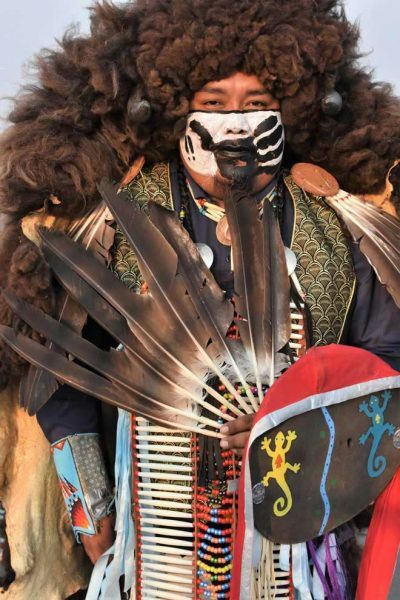 Navajo Times | Donovan Quintero A dancer has a light moment during the night performance of the Gallup Inter-Tribal Indian Ceremonial at Red Rock Park. 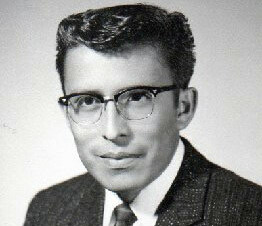 NextWho’s your pick for president?